Roll T Spheres under the foot, across the body, place them behind you in a seated position or lie on them to release muscle tension. Beginners: Use T Spheres with a soft cushion, pillow or in bed if the pressure is too intense when lying on T Spheres on the floor. Option 1: Bring water to a boil, add T Spheres for 2-3 minutes, remove and pat dry. Use caution with boiling water. Option 2: Microwave water in a microwave-safe bowl for 1-2 minutes, remove and pat dry. Use caution with boiling water. Option 1: Freeze for 30 minutes or more. Can be stored in the freezer in a resealable bag to retain freshness. Option 2: Place in a bowl of ice, in cooler or on an ice pack for 15 minutes or more. Discover even more techniques and tricks to using your T Spheres on our Training & Videos page. 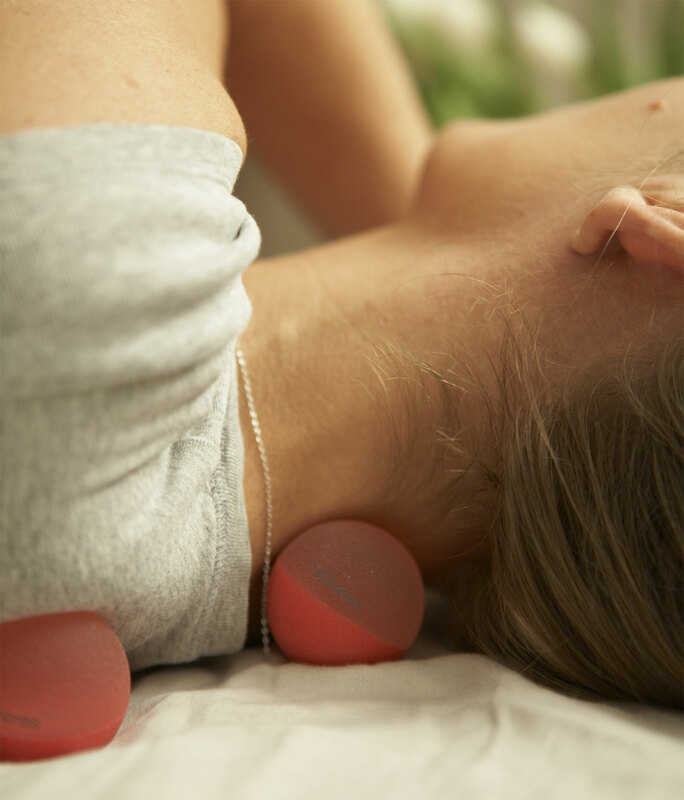 The aromatherapy infusion in the T Sphere massage ball is a patented process with each set infused perfectly and specifically in line with the essential oil used in that set. The infusion in manufacturing leaves no oily residue –one of the secrets of how we create them! The aromatherapy in the T Sphere massage ball is pure essential oil. We do not use manufactured scents or chemical binders in the process of making T Spheres. The specifics are trade secrets but the concept allows for the aroma to disperse for slow release of the essential oil and can last up to 3 months. The set will last 1-3 years depending on use and once you decide to retire your set - we recommend recycling it! Rinse with cool or warm water, air or pat dry then refresh with matching aroma refresher spray as needed. Additionally for deep cleanse, blend 25% hydrogen peroxide / 75% water for 5-10 minute soak then refresh with matching aroma refresher spray as needed. Do not use soap, rubbing alcohol, or antibacterial gels as this will damage the proprietary, textured rubber compound. Can I mix different T Spheres aromatherapy Bath & Body Oils and Refresher Sprays with My T Spheres set? The aromatherapy infusion in the T Sphere massage ball is a patented process with each set infused perfectly and specifically in line with the color and essential oil of that set. Therefore, you should use the matching oil line to accompany that specific T Spheres set. Follow the instructions for Refreshing your T Spheres on the ABOUT page. Can I use other essential oils with T Spheres? We do not recommend using other oils with our products. The specific amount of oil infused into our product line is what our patented process is all about. Disclaimer: T Spheres Inc. is not liable and will not replace any damages to the T Spheres set if you try to replicate the infusion process or refresh using other essential oil lines.